Before the late-1990s, dial-up was the standard way of connecting to the Internet. Accessing the Internet was a conscious action that involved negotiation between family members living in the same house. The nostalgic dial-up modem sound of Pshhhkkkkkkrrrrkakingkakingkakingtshchchchchchchchcch… was the bridge between the analogue and the digital. Today, we are living in a world where the Internet and connected devices have become ubiquitous. The excitement around connecting to websites has disappeared and the underlying mechanism of the internet is hidden. The Internet Phone is our attempt to make the intangible processes of the internet tangible in order to inspire people to learn more about it. We believe that by understanding the workings of the internet you will know more about our world and its essential technologies. 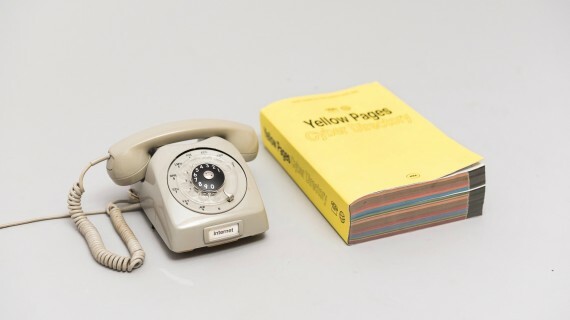 With the Internet Phone, you can access websites with the nostalgic interface of a rotary phone. Look up the IP address of the website you want to call in a special cyber directory, dial the twelve digit IP address using the rotary, and wait for your website to be read out loud in the receiver. If you are feeling adventurous, you can enhance your experience with four different mode tokens – article, developer, incognito, and history. We chose to leverage the existing telephone behaviours to demystify the invisible workings of the internet. Each step in the user experience is comparable to the process that a browser takes when retrieving a website. Looking up the IP addresses in a phone book is similar to how a browser gets an IP address from DNS (Domain Name System) directories. Dialling the twelve digits and waiting for the phone to retrieve the HTML content mimics how a browser requests data from web servers. The voice-to-speech reading of the website is comparable to how a browser translates HTML code into human understandable content. The Internet Phone was exhibited at the TechFest Makefaire and the Langelinie harbour in Copenhagen. People of all ages and walks of life experienced The Internet Phone. The reactions ranged from amusement to astonishment. Seniors usually reflected on the nostalgic factor of the phone and expressed joy in discovering a new use. Adolescents were very inspired by the unconventional approach of accessing the internet compared to the elaborate social media and messaging apps they are using on a daily basis.